Source: "Monument - Gillespie Gap, August 1971." Photo by Robert G. Bruce, courtesy National Park Service, Blue Ridge Parkway. Wording on the plaque is confusing regarding the story of Francis Marion and a battle from the French and Indian War in 1761 that took place at Etchoe Pass near the Georgia border. The exact location of Etchoe Pass was not known in 1927. Some researchers believe the sponsors of this marker thought the location of Etchoe Pass and Gillespie Gap were the same. It is not clear that was the case as others think it was simply commemorating a separate event in a different place in the manner of the 30th Division part of the inscription. THE ONLY REGIMENT INTACT IN THE CAROLINAS, / EAST OF KINGS MOUNTAIN AT THIS TIME WAS THE MARION / BRIGADE, FAMOUS IN SONG AND STORY, COMMANDED BY / GENERAL FRANCIS MARION IN THE WAR WITH THE CHEROKEE / INDIANS IN 1761. 30 MEN UNDER THE COMMAND OF MARION / WERE SENT TO DISLODGE THE INDIANS IN ETCHOE PASS, / SO THE MAIN ARMY COULD GO THROUGH. 21 OF THE MEN / UNDER MARION WERE KILLED BY THE FIRST FIRE OF THE / INDIANS. MARION WAS UNHURT. THE HEROISM OF THE EARLY / PATRIOTS SHOULD NOT BE FORGOTTEN. THE CONDUCT OF / MARION AND HIS MEN IN ETCHOE PASS ALMOST EQUALLED / THE HEROISM OF LEONIDAS AND HIS BRAVE BAND OF / SPARTANS AT THE PASS OF THERMOPYLAE. THIS HIGHWAY LEADING TO MARION IS NAMED IN / HIS HONOR ETCHOE PASS. IT WAS THE NORTH CAROLINA AND SOUTH CAROLINA / AND TENNESSEE TROOPS – THE 30TH DIVISION – IN THE / WORLD WAR THAT BROKE THE HINDENBURG LINE. An estimated 4,000 were in attendance for the July 4th celebration and unveiling ceremony. Judge Thomas M. Pittman, Chairman of the NC Historical Commission, presided over the day’s events that featured former Governor Cameron Morrison speaking on the heroes of Kings Mountain and Adjutant General J. Van B. Metts giving praise to the 30th Infantry Division (link to #337). Morrison gave tribute to the men who left their homes in the cause of independence. Metts noted the strange coincidence that September 29, 1780 was the day a large body of the Overmountain Men passed through the spot where the monument was being dedicated and 138 years later on September 29, 1918 the 30th Infantry Division had gained fame for breaking the German defenses on the Hindenburg Line. The Reverend James Thomas of Chestnut Grove Baptist Church gave the invocation for the ceremony and the Rt. Reverend Joseph Blount Cheshire; Episcopal Bishop of North Carolina gave the benediction. The monument was unveiled by a group of young ladies that included Anna Jackson Preston, great-granddaughter of Stonewall Jackson and Angela Morrison, daughter of the former governor. Music for the day was provided by the Spruce Pine Band. The Overmountain Men were backwoods men living west of the Appalachian Mountains from parts of North Carolina, Tennessee and Virginia. In September 1780 they passed through the Gillespie Gap on their way to join forces with Patriot militiamen from the Yadkin Valley and Piedmont of North Carolina and from South Carolina and Georgia to surprise the British Army at Kings Mountain. For more on the Overmountain Men read "The Overmountain Men and the Battle of Kings Mountain." The Battle of Etchoe Pass took place the Cherokee War of 1760-61; a sub-conflict of the French and Indian Wars. It began when whites murdered a number of Cherokees returning home from Virginia in support of French forces. Read more about the "Battle of Etchoe." The marker is on the grounds of the Museum of North Carolina Minerals, 79 Parkway Maintenance Road in Spruce Pine, at milepost 331 in section 2L of the Blue Ridge Parkway. The monument is surrounded by trees and mountains. 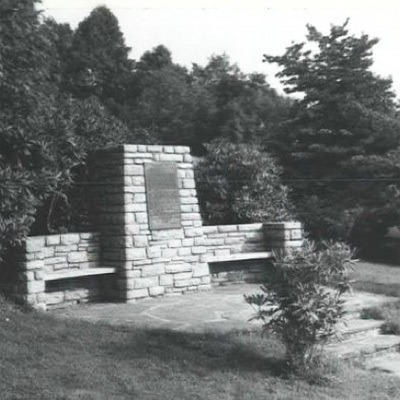 The monument was originally located nearby in McDowell County where the Overmountain Men camped on September 29, 1780. It was relocated in 1955 during construction of the Museum of North Carolina Minerals. The museum was dedicated on June 17, 1955 by Governor Luther Hodges.